Hello, readers! I hope you all had a terrific Thanksgiving! If you’re still in a turkey coma or are reluctantly finishing up leftovers, you’re probably ready for something new this week. For those of you partaking in juice detoxes, good for you! For me, personally, I still would like to eat solid food. 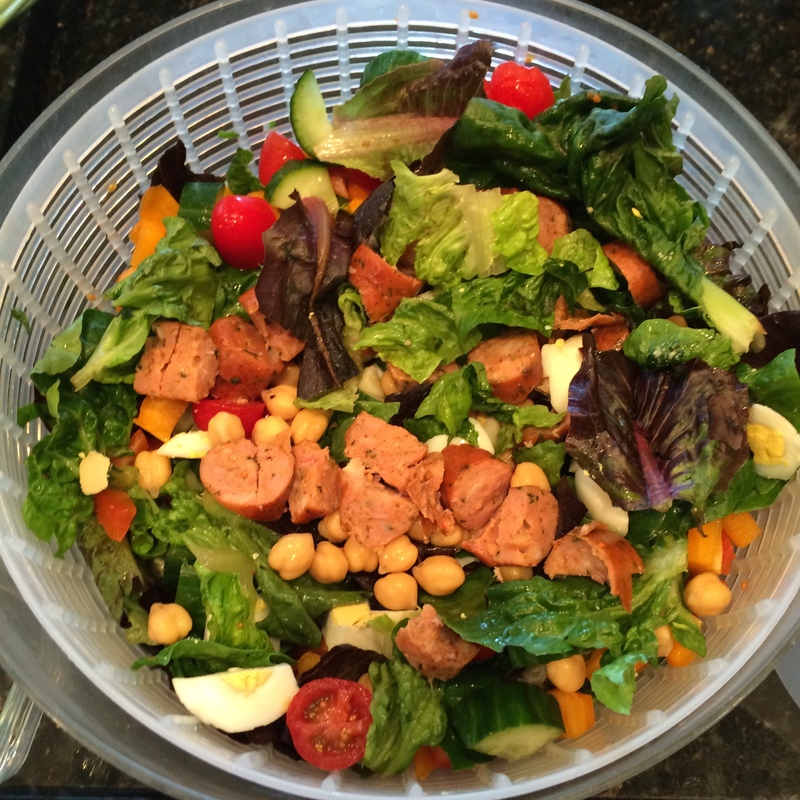 To get my week started on a healthy note, I made a BIG salad to last me several days. It’s lighter than gravy and mashed potatoes, but doesn’t leave me feeling deprived. In fact, I am bold enough to say that it would even please the “meat and potatoes” eaters out there. I think about my dad, who can’t order a salad without it have some kind of meat source on it, and he’d prefer there to be A LOT of it. I don’t blame him; sometimes, a meatless/fishless salad just doesn’t do it. My goal was to create a salad that “hits the spot,” and that my dad and other meat-lovers out there would even consider eating as a meal. The beauty of salads is that there are truly no limits…no bread or wrap that’s restricting the amount of ingredients you can add. I love that. My “Mighty Meaty Salad” is not a “diet food” or “light” option, but rather is a healthy, filling, and DELICIOUS meal that produces leftovers for one or a meal for many. Share your thoughts or your own favorite salad with me here on the blog, or on Facebook, Twitter, and Instagram! 1. Bake sausages according to package directions. I baked mine at 400º for about 15 minutes until browned and crispy on the outside. I used Coleman Natural brands’ “Mild Italian” chicken sausages, which come already pre-cooked. 2. Boil your eggs. Click here for the perfect hardboiled egg. 3. While sausages and eggs are cooking, wash and chop your veggies, and rinse/drain chickpeas. 4. When eggs and sausages are done, cut into small pieces. Mix all ingredients together in a big bowl, and EAT with whatever dressing or dip you like! You made goal! This salad hit the spot!